More than a half of Russian citizens support restrictions that Moscow imposed on food imports in response to Western sanctions. 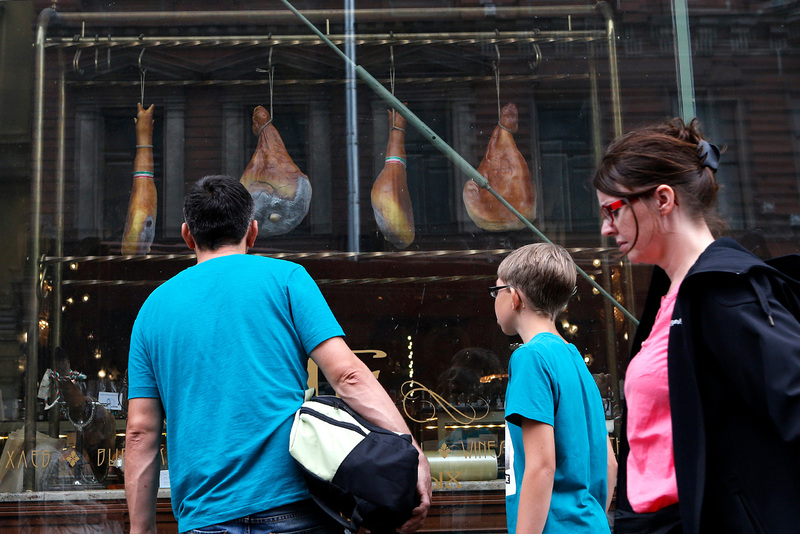 Photo: People pass by a shop window displaying Spanish ham for sale at a grocery store in St. Petersburg. Imported goods have never been main expenditure for public. Three-quarters of Russians believe that Western sanctions against Russia have not created any problems for their families. This is according to an opinion poll conducted by the Levada Center in April, RBC reports (in Russian). Forty-three percent of respondents see "no major problems" and 32 percent see "no problems at all" as a result of sanctions. In August 2015, 53 percent did not see "major problems" and 14 percent saw "no problems at all." In the opinion of 40 percent of respondents, Western sanctions have most likely been more harmful for those who initiated them than for Russia. At the same time, only 12 percent believe that sanctions have caused a lot of damage to Russia. Another 35 percent think that the restrictions cause damage in equal measure to both sides (the popularity of the last two answers has gone down since last year). More than a half of Russian citizens - 65 percent - have a "definitely positive" or "rather positive" attitude to restrictions that Moscow imposed on food imports in response to Western sanctions. A total of 21 percent have a "negative" or "rather negative" attitude to the counter-sanctions. The number of those who support and oppose counter-sanctions has by and large remained the same since August 2015. The Levada Center survey was conducted on 21-24 April 2017 among 1,600 people in 137 population centers across Russia. In March 2017, VTsIOM (Russia’s Public Opinion Research Center) reported that over a third of Russians (35 percent) believed that anti-Russian sanctions had merely worked in Moscow's favor. Over the past two years the number of sanction "optimists" has doubled and reached a record high. The sanctions policy continues to leave the majority of Russians unaffected but there is a certain weariness about it, Marina Krasilnikova, head of the Levada Center department for the study of incomes and consumption, told RBC. "People believe that the sanction policy doesn't create particular problems for the country or in their everyday lives. This is to do with the fact that in reality buying imported goods has never been the main item of expenditure for the majority of the population. And that includes delicacies such as imported cheeses and sausages," she said. Most respondents see no connection between the policy of sanctions and the economic crisis, Krasilnikova noted. The countries of the European Union, the U.S. and several other states introduced restrictive measures against Russia in 2014, linking them to Crimea's becoming part of Russia and later to the conflict in Donbass. In response, Moscow imposed a ban on food exports from most of the countries supporting the anti-Russian sanctions. Read more: Why can't Russia supply itself with apples?